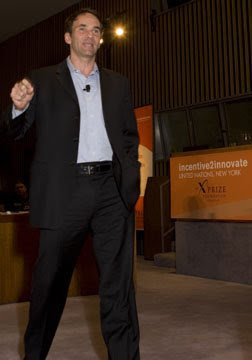 I spoke at the X PRIZE Foundation’s incentive2innovate (i2i) Conference last month in NY. But when it was my turn at the podium, my take was that a conference about collaboration and innovation shouldn’t be dominated by one way communication – so as usual, I got the audience interacting with each other. Also as usual, my emphasis was on the need to be CANDID. When candid exchanges between people collide, the fusion generates entirely new insights, new ideas, and new approaches—what we collectively call innovation, where value is created—that might never have been considered independently. Candor gives us the ability to take risks, preparing us to solve problems collaboratively—both at work and in our personal lives—with better results than we would ever have achieved alone. So the question is, how do we create a culture of candor in our workplaces? For one, we need the core mindsets of Generosity and Vulnerability to create what I call a “safe place” where we can trust each other to be honest. But also, whether or not you’re officially a leader in your workplace, you can create a tremendous impact on its culture just by showing others the value of inviting in candor. With that in mind, here are some specific tips for drumming up some candid feedback in your life and work. We can’t be candid with everybody—nor would we want to be. Which is why we should each find or create a workplace where we're surrounded by people whom we respect. What do I mean by respect? It comes down to acknowledging another person’s uniqueness, value, perspective, and wisdom. If you don’t respect someone, believe me, they’ll sense it, and it will be impossible to establish a safe place between the two of you. Express your gratitude when you receive feedback. What you’re asking for is a gift—of time, honesty, and thoughtful feedback. Don’t try to pretend to be something you’re not. Most of us know, deep inside, what’s holding us back. By acknowledging that you have things to work on, you make it much easier for others to be honest with you. You might begin: “Listen, I know I’ve got plenty of stuff to work on, but I hoped you might be able to point out a few things in particular that I could focus on.” By acknowledging up front that you’re imperfect (who isn’t? ), you pave the way for another person to be honest with you. You’re not asking for advice to put the other person on the spot, or to “test” her. You’re certainly not going to get angry or defensive. Make clear that you’re simply gathering information and you'd like his or her honest opinion. My advice is to begin generally and wait for the other person to make the first move by coming up with something specific. If she hems, haws, and otherwise resists giving you targeted feedback, say something like, “Really—I mean it. I would be deeply appreciative.” Then pause. A pause is a very effective way to encourage others to respond—most people will do anything to avoid an awkward or embarrassing silence. Be sure you don’t start by leading the witness—by identifying your faults and asking the other person to confirm them. You’re after candor here, not an echo effect. Remember that asking for criticism doesn’t mean you have to act on it. Criticism is what it is: candid feedback from someone you respect and whose opinion matters to you. Ultimately, you decide how or whether you use or act on that feedback. When I disagree with someone’s perspective, I simply say, “Thank you,” or “I appreciate hearing that.” If I’m confused, I’ll ask for clarification—before thanking the person once again!